Heyco TITE" Liquid Tight Straight-Thru Cordgrips" - Bolt Products Inc.
Home » Liquid Tight Cordgrips » Straight-Thru Cordgrips » Heyco TITE" Liquid Tight Straight-Thru Cordgrips"
Widest range of cable and/or thread sizes available. 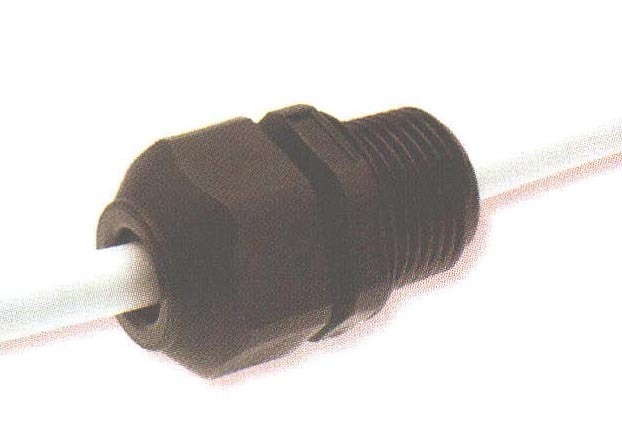 Includes six threads and seven bodies for cables ranging from .065 (1.7 mm) to 1.260" (32.0 mm). “Ratchet design” of sealing nut assembly provides superior antivibration protection and ensures a firm grip on the cable. Integral “Sealing Ring” ensures a Superior seal at mounting location every time. All nylon construction with Buna N Sealing Gland resists salt water, weak acids, gasoline, alcohol, oil, grease, and common solvents. This feature is not assessed by UL certification or testing. Suitable for NEMA 6P enclosures. Working Temperatures : -22°F to (-30°C) to -212°;F (100°C).